What Does the 2019 Balikatan Exercise Tell Us About the US-Philippines Alliance? The exercise highlights some of the ongoing activity in the defense aspect of the relationship amid broader trends. On April 1, the United States and the Philippines kicked off this year’s iteration of what has traditionally been the largest military exercise between the two treaty allies. The exercises once again put the spotlight on the ongoing activity within the U.S.-Philippine alliance amid a mix of inroads and lingering challenges. As I have noted previously in these pages, despite initial uncertainties and more enduring challenges created for the U.S.-Philippine alliance during the tenure of Philippine President Rodrigo Duterte, defense ties between the two sides have actually not only been sustained in most areas, but even quietly expanded in some realms, including in terms of specific metrics such as the number of exercises held. That general trend has continued into 2019 as well, with some notable developments including Secretary of State Mike Pompeo’s clarification last month while in Manila about the applicability of the 1951 U.S.-Philippine Mutual Defense Treaty to the South China Sea (See: “Managing the US-Philippines Alliance: The Limits of Commitment Clarity”). One of the key engagements with respect to the U.S.-Philippines alliance has been the Balikatan exercises, traditionally the signature military exercise for the alliance relationship. After some doubts about the future prospects of the exercise following comments from Duterte and an initial downscaling, the exercise saw a boost in 2018, with the number up to around 8,000 personnel from the 5,000 in the previous year. On April 1, the United States and the Philippines kicked off the 2019 iteration of the Balikatan exercises. Though the humanitarian assistance and civic assistance projects of Balikatan had in fact already officially begun on March 12, this week marks the start of the exercises component, which often grabs the most headlines. It was officially kicked off with an opening ceremony at Camp Aguinaldo in Quezon City. Per official Philippine accounts, this year’s iteration of Balikatan will feature about 4,000 Philippine troops, 3,500 U.S. troops, and 50 members of the Australian Defense Force (roughly the same number as last year). The exercises will take place largely in Luzon and Palawan and last until April 12. As is usual, the exercise features a range of areas, and this year, the scope includes amphibious operations, live-fire training, urban operations, aviation operations, and counterterrorism response. This year’s iteration of Balikatan has a number of notable features that both sides have flagged. 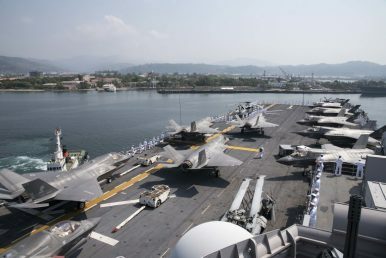 Chief among these is the fact that this is the first iteration of the exercise featuring new fighter jets from the United States, with the F-35B Lightning II aircraft paired with the USS Wasp, a U.S. Navy multipurpose amphibious assault ship. Such boosts for iterations of the exercise are usually characterized as indicators of increased commitment, and this instance was no different, particularly as it comes amid the continued rollout of the Trump administration’s Free and Indo Pacific Strategy. Another notable feature was the growing multilateralization of the exercise. In addition to Australia’s inclusion in what was initially a U.S.-Philippine bilateral engagement, this year featured continued participation by international observers, including those from Southeast Asia as well. This aspect was yet another demonstration of Balikatan’s evolution into a wider engagement that typifies broader networking among alliances and partnerships in the region, rather than just being a bilateral exercise. To be sure, a more comprehensive assessment of the 2019 Balikatan exercise will have to wait until the exercises themselves conclude, because there may be some more specifics that are released later as well. And as I have noted previously, one’s assessment of the significance of these exercises for the state of the U.S.-Philippine alliance more generally is in part contingent on what one uses as the basis for comparison, whether it be the previous year or past inflection points in the alliance relationship. Nonetheless, engagements such as Balikatan continue to provide one useful data point to assess a complex alliance relationship. While Washington's new commitment clarity may be significant, the broader and longer-term challenges of alliance management remain.